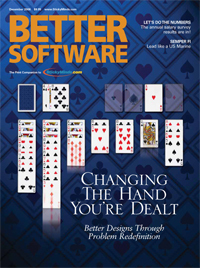 Hundreds of Better Software magazine readers and StickyMinds.com users logged on and gave us the scoop on the industry's employment outlook. Find out how your software engineering peers responded to our annual salary survey. Miska Hiltunen takes a look at his own Tick-the-Code Inspection, Mihaly Csikszentmihalyi's study of happiness, and how you can cultivate quality through practical methods of empowering your software engineers to improve their own work. The path to Ajax has its pitfalls, but using it carefully can put you ahead of the game. Tod Golding offers some tips to help you investigate the world of Ajax solutions, technologies, frameworks, and patterns and find a balance between an enhanced user experience and a robust application. When you're not feeling well, you go to the doctor for a checkup. If your organization's test process isn't working as well as you'd like, you should give it the same treatment. Ruud Teunissen offers advice on performing an in-house test process assessment. The value the U.S. Marine Corps places on teamwork can improve your software development team as well. Former USMC member Sean Buck shares how correctly applying Marine Corps principles will lead the way toward better, more effective test teams. The requirements process is not a linear one. In this article, Michael Bolton helps you get in the game by showing how the elements of the requirements process–reference, inference, and conference–interact and influence each other. When planning your workload, it's easy to bite off more than you can chew. But as Michele Sliger explains in this tale of one overachiever's attempt to take on too much work, overcommitting yourself means overcommitting your team. Spending a little more time in design can help minimize the complexity of debugging and maximize the likelihood that the elements of a project will come together in the end. Payson Hall uses a parable and a program fragment to show how small changes to the problem can simplify the solution.